Every time you visit First Dental Studio, you’ll receive one-on-one attention from our dentists. 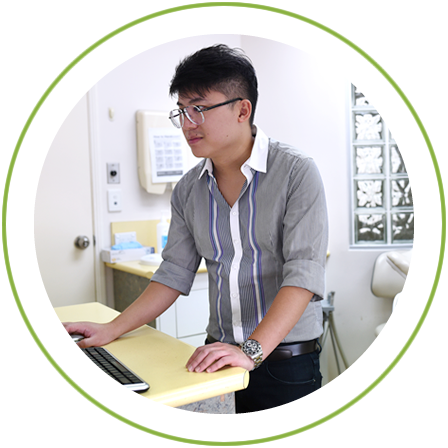 Our philosophy is to be the best dentist in Brisbane by putting your dental wellbeing first. We strive to keep your dental appointments efficient and convenient. If we find that you present with a problem that we cannot manage in-house, we can refer you to a nearby specialist. We believe in offering a positive dental experience for all our patients focusing on exceptional results and patient comfort. A vital part of enjoying excellent dental health is having the knowledge to prevent future problems from occurring. We encourage regular six-monthly checkups that will catch issues early, as well as strive to give each of our patients a thorough education in proper oral hygiene habits. 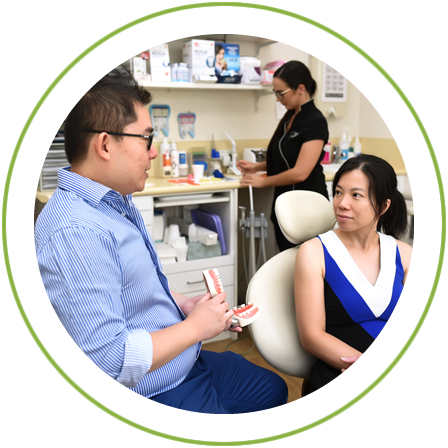 At your regular appointments, we’ll spend time talking to you, educating you on how to have the best possible oral health. If future treatment is needed, we are happy to discuss your options and set you up for any subsequent visits that are required. Read More. Both composite resin and glass ionomer cement (GIC) are available to fill your teeth. The materials we choose are strong and provide an appropriate colour match to the rest of your teeth. Read More. If a tooth cannot be saved by a solution such as a crown, extraction may be the best possible option. We’ll make sure that you are comfortably numbed or sedated for the procedure. Read More. We can assist you in maintaining the structure of your existing dentures or in creating a new device for you. Partial and acrylic dentures are available. Read More. Our dentists have completed several courses to help you benefit from the latest techniques in root canal treatment. Our rotary endodontic setup allows a quicker procedure for your ease and comfort. Read More. A smile that you feel proud to show off can make a tremendous difference to your self-esteem. At First Dental Studio, our knowledgeable dental team offer several restorative and cosmetic solutions to get you the smile you’ve always wanted. We will create durable crowns and bridges with e.max porcelain which has a similar strength as the enamel of your natural teeth. Front and back teeth can be replaced with crowns and bridges. Read More. The most advanced solution to replace one or multiple missing teeth, dental implants look and feel just like a natural tooth. We’re happy to consult with you and determine if it’s the right option for you. We use Straumann® products for dental implants, which are strong and long-lasting. Read More. If you would love to feel more confident with a straighter, cleaner, brighter smile; we have a range of options to suit your budget. ClearPath® wafer-thin aligners are worn for 22 hours a day and can be taken out at your convenience. This unique patented technology allows the aligner to grip your teeth, shifting them into the desired position. Dr Vincent and Dr Allen are trained and certified in providing ClearPath. Read More. If you want to straighten only your front teeth, Quick Straight Teeth™ are an efficient option for mild misalignments. Clear ceramic brackets and tooth-coloured wires are used, placed only on your front teeth. Dentists Dr Vincent Wan and Dr Allen Wan are certified in the Quick Straight Teeth Short Term Orthodontic Treatment. Read More. Thanks to state-of-the-art dental technology, Dr Meena Hegde can help patients to achieve a straighter smile with Invisalign clear plastic aligners. These are made of transparent materials and are practically invisible when worn on the teeth. Read More. Zoom!® in-chair whitening is a well-established system to get you the greatest possible change in tooth colour without risk to your oral health. Your visit will take a total of 90 minutes, with 60 of that being in the chair. Read More. If you want whiter teeth than what is possible with a whitening system, or you want a Hollywood-style smile, veneers may be a solution. Thin porcelain is applied to the front teeth for a perfectly aligned look. Read More. You might be grinding or clenching teeth in your sleep without even knowing it. When you visit First Dental Studio, we’ll check to see if there is any wear on your teeth and assist you to correct it. We can also help with splints to relax your jaw. Read More. If you snore or have been diagnosed with sleep apnoea, we have devices for people who can’t or don’t want to wear a CPAP machine. These devices open up your airway so that you don’t have any obstruction during the night. Read More. No gap for health fund participants, or $190 (a $295 value) if you do not have a health fund. Includes comprehensive oral examination, two dental X-rays, treatment planning, professional clean and polish, preventive fluoride treatment, oral hygiene gift pack and oral hygiene advice. Contact us to find out more.